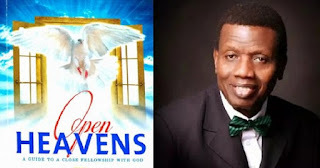 Open Heaven [20 May 2018] From Jacob to Israel - Open Heavens Daily Devotional Messages, By Pastor E.A Adeboye. Concerning regeneration, the key element is change. God is calling all of mankind to change through the power of His word. However, there is a strong resistance of this change in every human being (Romans 8:7). This resistance comes from the mind and the body, and must be overcome before any real change can manifest;. The transformation experience requires serious effort to overcome this resistance (Romans 12:2). Whenever anyone surrenders his or her life to Jesus, God takes hold of the old lifeless creature and fashions it into a new creature that is heaven-bound, full of life and suitable for His use. Have you experienced this transformation indeed? The inner transformation that Jesus gives must manifest as outward change for all to see.